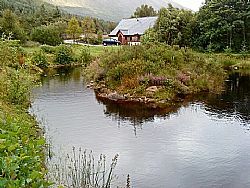 13 years ago John and Sheila Goodall bought 17 acres of West Highland bog at the top of Glen Loy where there was a pile of rubble (the remains of a house), lots of rubbish, a telephone line of sorts but no electricity. A new home was built by Roddy Campbell, but because connecting to the grid was going to be prohibitively expensive, John and Sheila had to generate their own. The river Loy which splits in two as it runs through their land seemed an obvious source of power, but SEPA demanded smolt screens both above and 350 metres below the intake which was going to cost a great deal of money. In the end they had to use a burn for which they have an inalienable right to take water from. Unfortunately it is small and after a long dry spell runs at only 1 litre per second. In 1996 alternative energy was not nearly so popular as today and the only person willing to take on the project was Gordon Proven of Proven Energy. 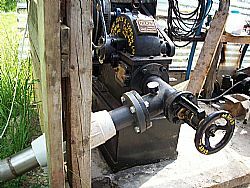 He designed and built a water turbine which was intended to produce 4 Kw but only ever managed 2.5 Kw. It worked very well for 9 years and then the adjustable rubber nozzle began to disintegrate. Unfortunately Gordon was unwell by that time and John had to seek advice elsewhere. An initial attempt using a BA ‘cast-off’ pelton wheel produced only 1 KW at a cost of £5,000 and bearings wore out within 6 months. John then sourced a 1948 Gilkes pelton wheel which was renovated by Ian Blyth of Autocraft. Initially it was attached to a small fixed magnet generator which lasted for only 3 mont hs before burning out. John then tried a reversed induction motor which failed to work at all (it requires 3 phase electricity). 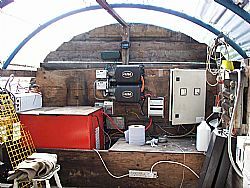 Finally John reattached Gordon Proven’s fixed magnet generator and after a total expenditure of £10,000 on modifications he now has a reliable system producing 2.5 kW. This is more than enough to run 2 houses (without cooking) provided there is sufficient battery storage which should be of at least 500 kW hours at 48 volts. 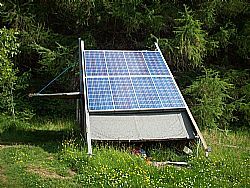 To supplement the hydro John installed a PV array with the total area of about 4 sq metres (8 panels) situated in the garden, close to the turbine shed. They complement the hydro scheme, really coming into their own during dry sunny weather. If all aelse fails, they have a backup 12kW diesel generator which is used as infrequently as possible. The house is of course highly insulated and double glazed throughout, with passive solar from the conservatory helping to warm the rooms during the day. During the winter months the house is heated by wood burning stoves and electric storage heaters, When they bought the property they set about planting thousands of trees, some of which were intended as firewood and are now ready to use. For heating the cottage, built 2 years ago, John decided on a ground source heat pump and underfloor heating. The heat-pump involves 2x100m loops of pipe buried 1 meter deep in the surrounding ground while a third loop is submerged in the nearby pond. The system now works well after many initial problems with the electric soft start for the heat pump but Invisible Heating Systems who supplied the system have acknowledged the problem and have corrected it satisfactorily. The systeam heats a 400 litre tank in 1 1/2 hours using about 2kW. Both houses are looking forward to experiencing a comfortable winter without power cuts!